Two sections of Riverside Drive recently received bike lanes. While, combined, the two sections of bike lanes don’t even add up to a mile, these are integral pieces in closing the gaps in the Valley’s existing bicycle network. 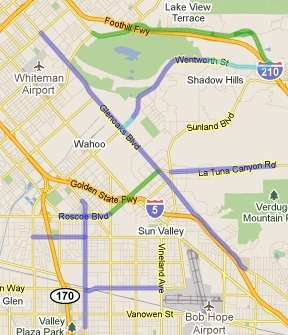 One section of new the bike lanes stretch 0.54 miles from Fulton Avenue to Coldwater Canyon Avenue, while the other section of bike lanes stretch .25 miles from Woodman Avenue to Sunnyslope Drive. Why are these two sections so important? Because they connect three interrupted sections of bike lanes along Riverside Drive. Now that these two sections are in place, there ares uninterrupted bike lanes for 2.75 miles on Riverside Drive from Tyrone Avenue in the west to Laurel Canyon Boulevard in the east. But beyond closing the gap on Riverside Drive, these new bike lanes contribute to creating a true network of bike lanes in and around North Hollywood. As you can see in the image above, the network of bike lanes (blue), bike paths (orange) and bike routes (purple) is becoming ever more interconnected. This network will grow even more with the extension of the Riverside Drive bike lanes to Van Nuys Boulevard – this section having just completed its design phase. Two projects on, or adjacent to, Wentworth Street are also extending and connecting existing bicycle networks in the Valley. First, the existing bike lanes on Wentworth (which used to end at Wheatland Boulevard) have been extended 1.52 miles east to Foothill Boulevard. This extension of the Wentworth Street bike lanes will eventually connect to bike lanes on Foothill Boulevard which will extend westward for nearly 4 miles all the way to Osbourne Street. Second, a bike lane gap between Wentworth Street and Glenoaks Boulevard has been closed. Bike lanes have been placed on a 0.30 mile stretch of Sheldon Street from Glenoaks Boulevard to Wentworth Street. Just like the Riverside Drive bike lane projects, this seemingly small section of bike lane connects two huge stretches: 3.36 miles of bike lanes on Wentworth and 6.25 miles of bike lanes on Glenoaks Boulevard. This connection of bike lanes will become even more impressive once the next project, which has just completed its design phase, is installed. Another relatively small section of street, the Tuxford Street bike lanes will stretch 0.58 miles from Lankershim Boulevard in the south to Glenoaks Boulevard in the north. This section of bike lane, however, will connect the Glenoaks bike lanes to bike lanes on Roscoe Boulevard, Laurel Canyon Boulevard, Strathern Street, and Sherman Way – a combined 6 miles of bike lanes. LADOT has completed design to build a couplet of bike lanes as part of Phase 3 for the LA River Bikeway. These bike lanes will run as a north/south couplet on Avenues 18 and 19 from North Spring Street to Barranca Street, and then on Avenue 19 to San Fernando Road. This is the first step in bridging the difficult gap between the end of the current LA River Bike Path at Egret Park and the southern end of the LA River Bikeway Phase 3 at Union Station. Extending the recently installed Woodely Avenue bike lanes (Sherman Way to Saticoy Street), these bike lanes will run from Saticoy Street to Stagg Street. Once installed, the Woodley Avenue bike lanes will run for 1.75 miles from Victory Boulevard to Stagg Street. Boyle Heights will soon be getting their first bike lanes. Design is complete for 1.60 miles of bike lanes on 1st Street through Boyle Heights from Boyle Avenue to Lorena Street. There are sure to be more developments as the summer progresses; Projects like the 4th Street Bicycle Friendly Street and the bike lanes on 7th Street are top priorities in the department. When new information becomes available, LADOT will be there to let you know.